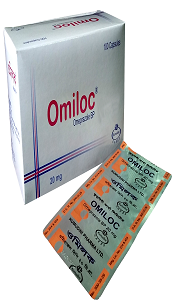 Omiloc 20mg Capsule Each Capsule contains Omeprazole BP mg as enteric-coated pellets. 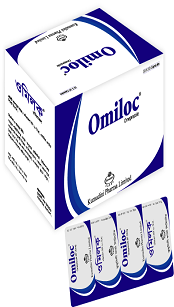 Omiloc® capsule is indicated for gastroesophageal reflux disease including reflux esophagitis, acid reflux disease, duodenal and benign gastric ulcers, Helicobacter pylori eradication regimens in peptic ulcer disease, prophylaxis of acid aspiration, Zollinger-Ellison Syndrome (ZES) and for the treatment of NSAID-associated gastric ulcers, duodenal ulcers or gastroduodenal erosions. Omeprazole is well tolerated, nausea, diarrhea, abdominal colic, paresthesia, dizziness and headache have been stated to be generally mild and transient and not requiring a reduction in dosage. When gastric ulcer is suspected, the possibility of gastric malignancy should be excluded before treatment with Omeprazole is instituted, as treatment may alleviate symptoms and delay diagnosis. Paediatric use of omeprazole is not yet established. Omeprazole is contraindicated in patients with known hypersentivity to any of the components of the formulation. Drug that are metabolized by cytochrome P-450 system such as cyclosporine, benzodiazepines have been reported to show interactions with Omeprazole. Omeprazole can delay the elimination of diazepam, phenytoin and warfarin. Reduction of warfarin or phenytoin dose may be necessary when Omeprazole is added to treatment. There is no evidence of an interaction with theophyline, propranolol or antacids. Keep in a dry place, away from light and heat.